Goose Diaper Holders are, in my opinion, the only way to have a goose in the house, vehicle or lap. This one is my own design that I fashioned for our own gosling, Eden. This is my Edbmen Gosling, Eden, in the photo wearing her own diaper holder. The one you are buying is new and have never been used. This one is for a Gosling that is (USUALLY!) starting to feather out. It is very adjustable. Color shown is what your will receive if adding this items to your cart. They grow so fasssssst! If it arrives and it would be a bit too big, wait a day or two (literally) and try it on your baby goose again. The Goose Diaper Holder comes to you with two Pantie Liners to get you started. The Goose Diaper Holder I have designed is made of polar fleece. Polar Fleece is light weight, soft, has a bit of give/stretch to it and can be washed in the washing machine or by hand and hung to dry. Polar Fleece was created for sportsmen. You can wash out polar fleece, ring it out very well, and put it back on, even damp it will dry pretty quickly. When polar fleece first came out I was backpacking with and training and racing sled dogs....wonderful stuff. Before it, fabrics used would hold the water or wetness that sportsmen would encounter. Polar Fleece is non absorbent and perfect for Goose Diaper Holders. 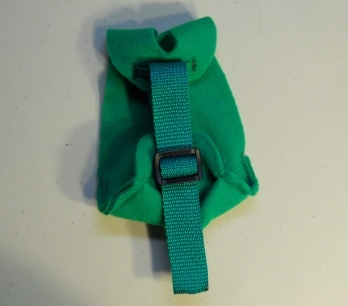 The Diaper Holder is held on, or holds together, with a small high impact plastic slide. Once set to size it will stay put. The slide is well padded by the 1" poly webbing and polar fleece. 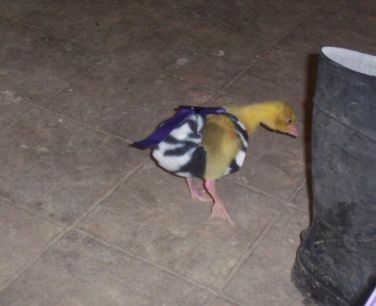 It makes this Goose Diaper Holder very comfortable and secure for the gosling wearing it. We line our own Diaper Holders with pantie liners cut in half for the real young birds and grow the liner as the bird grows. We are however working on a cloth diaper for the Goose Diaper Holders we hope to offer in the near future. YOU ONLY PAY SHIPPING ONCE PER ORDER. THAT'S RIGHT, NO MATTER HOW MANY ITEMS YOU BUY FROM MARNA'S MENAGERIE IN ONE ORDER/PER ORDER YOU WILL ONLY PAY THE SHIPPING CHARGES FOR THE HEAVIEST ITEM. ALL OTHER ITEM SHIP FREE! Each item sold is new and never used or been around any other animals unless it says otherwise on the selling page. The photos you see of the animals with, on or in our products are items that my animals own. The items I sell are items I use an make for my own animals. Please note: If you see something you like, buy it now. I may or may not have that same print or type of fabric in stock and fabric stores do not keep the same fabric long... so I may or may not have the items long. The Diaper Holder described here, with photo shown is the one you will receive if you place your order from this page. We have found, in the past, that some people only want it use our items for photos and then return them... this and the fact that once "outside animals" have worn or used our items there is a possibility of bringing in diseases to our animals here at Marna's Menagerie. Thanks for understanding. This smaller item has a smaller shipping charge of $1.95 to the USA when shipped with similar items. Your shopping cart will show your shipping costs and total based on the items in it. Can My Duck Make Me Sick?